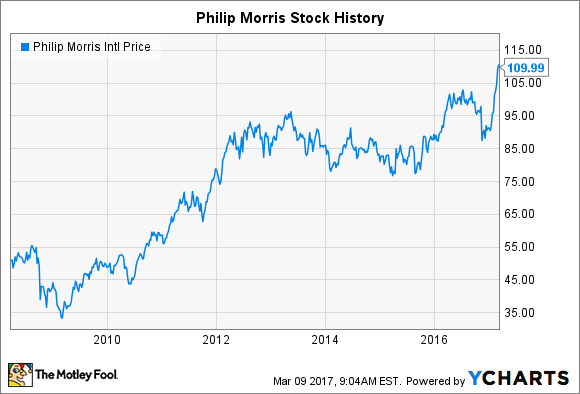 Philip Morris Stock History: What's Ahead for the International Tobacco Giant? The Marlboro maker is at all-time highs. The tobacco industry has been a big winner for longtime investors, and Philip Morris International (NYSE:PM) has reaped its share of stock-price gains since Altria (NYSE:MO) completed the global tobacco unit's spinoff in 2008. Philip Morris stock has recently climbed to new all-time record levels, but even though the stock price has doubled since its IPO, Philip Morris has had to endure long periods of uncertainty and flat performance along the way. Looking forward, investors are hopeful that the future for Philip Morris stock will return to its upward trajectory for the long haul. Philip Morris' emergence in early 2008 proved to be unfortunately timed, given that it came immediately before the recession and financial crisis that threw the entire global financial market into disarray. Philip Morris stock was somewhat insulated from the worst of the declines because of its loyal customer base and popular products, but even it suffered losses of more than a third at its lowest levels. However, it didn't take long for the tobacco stock to recover most of its lost ground, and the early 2010s were a period of strong growth for Philip Morris. Unlike Altria and other U.S.-based tobacco manufacturers, Philip Morris enjoyed a relatively lax regulatory environment that allowed it to take greater advantage of growth opportunities, and the company did so with vigor during the early years of the economic expansion. By 2012, the stock had climbed into the $90s, and a strong dividend yield amplified total returns for shareholders. At that point, though, things started to get tougher for Philip Morris. On one hand, many foreign governments started to get stricter about trying to regulate their domestic tobacco industries, and that in turn led to greater obstacles for Philip Morris to overcome in order to foster growth. In particular, plain-packaging restrictions threatened to negate much of the billions of dollars that Philip Morris had spent on marketing efforts, creating a more level playing field that took away much of the Marlboro brand's competitive advantage. Legal efforts from the tobacco industry to fight plain-packaging restrictions weren't as effective as investors had hoped, and gradually, the international tobacco market started to resemble more closely its U.S. counterpart in terms of regulation. Affecting Philip Morris in particular was the strength of the U.S. dollar. Even though the tobacco giant managed to produce significant growth in local-currency terms, the fact that many key foreign currencies had seen their value drop against the dollar means that Philip Morris couldn't translate its overseas success into climbing figures on its financial statements. Earnings growth came to a near-standstill, and what had been lucrative double-digit-percentage dividend increases gave way to more modest token boosts that nevertheless taxed Philip Morris' ability to return capital to shareholders. The company also stopped buying back stock, taking away further support to its share price. Philip Morris' recent push to new all-time record highs reflects improving conditions for the company. The key has been an end to the dollar's advance against major foreign currencies, which has allowed Philip Morris to see more of its organic growth show up in its net income. Yet even more interesting is the philosophical shift in Philip Morris' core mission. After decades of pursuing traditional cigarettes, Philip Morris is embracing reduced-risk products, and early offerings like its iQOS heated tobacco system have met with rave reviews in key markets like Japan. Philip Morris executives have even started to envision an industry without traditional cigarettes in the distant future, and hope for a new growth driver has helped fuel a new rally for the stock. Philip Morris International has a lot going for it, including a high dividend yield, share-price momentum, and a product with worldwide popularity. As it moves forward, Philip Morris will have to execute well to take maximum advantage of its current opportunities if it wants to see its stock keep moving higher.